I got a chance to use that tahini paste after I finally located it. So, this will be a tahini update — not a Tahiti update for those of you who were reading fast and thought this was going to be a post about the beach. I wish it was a post about the beach; it snowed a couple inches here over the weekend, and ice is on the way right now. But, alas, back to the tahini. I got chopping. The parsley smelled made the kitchen smell like a freshly mown lawn, which might sound disgusting, but if anyone is as tired of winter as I am, I highly recommend that you go out and buy a bunch of parsley to chop. Even if you don’t use it, I promise the one dollar will be worth it. The smell will remind you that spring is coming; we won’t be in a perpetual winter. Then, I moved on to the mint…yum. I even saved a sprig so I could have a cup of genuine mint tea after the cooking was done. As my collection of ingredients grew, I was getting pretty excited — healthy, smelling good, and colorful. I whipped together the dressing, and I was ready to put everything together for the grand finale. I grabbed a fork, and I was ready to dig in for a sneak preview of my lunches for the remainder of the week. The tabbouleh tasted terrible. Really, I jumped and almost gagged. I hated it. But, channeling my mom’s advice that more than one bite is necessary for a true judgment call, I dug in the fork again. The time-consuming concoction was tasting just as bad the second time around. 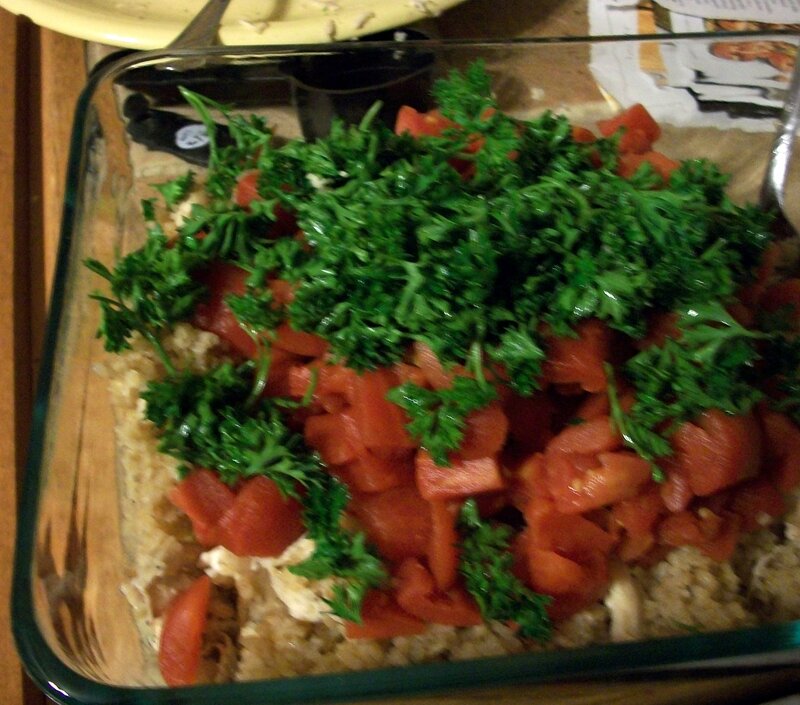 For a minute, I looked at all the measuring cups and knives and parsley trimmings littering the kitchen and looked at how late it was getting, and I almost took the entire dish of tabbouleh and sent it down the garbage disposal. But, reason prevailed. I knew I was hating it because of the Greek yogurt in the dressing, but I know there are other people who love Greek yogurt, so I decided to take the food to work with an (anonymous) note that invited others to try the tabbouleh. It was gone in two days, and at least two people who tried it took the recipe. So, in the end, it wasn’t a complete loss. I still got to smell the promise of spring, found a great musical artist, and got to enjoy a nice cup of mint tea, and my co-workers got some supplementary lunch. Wilkie Collins! Be still my heart! I like tahini, too, but I’m with you on tabouli. I read a lot of Wilkie Collins while doing research to write The Aurora County All Stars. Which Collins novel is your favorite? I was happy to see the library make them available in audio format; their length doesn’t make them ideal bathtub reading 😛 I’m starting with The Woman in White, but only because it was published before Moonstone, the other book the library has available. Hope writing is going well!